Barn wood delivers: If you are looking for warmth, character and rugged good looks, it can’t be beat. The term “barn wood” refers to rough wood planks with a distressed finish, usually used as a wood accent wall. Some barn wood may be reclaimed from old barns, others from former commercial buildings like factories or warehouses. Another characteristic of salvaged wood: the surface of the boards or planks can show remnants of paint, nail holes, saw marks or other signs of wear. 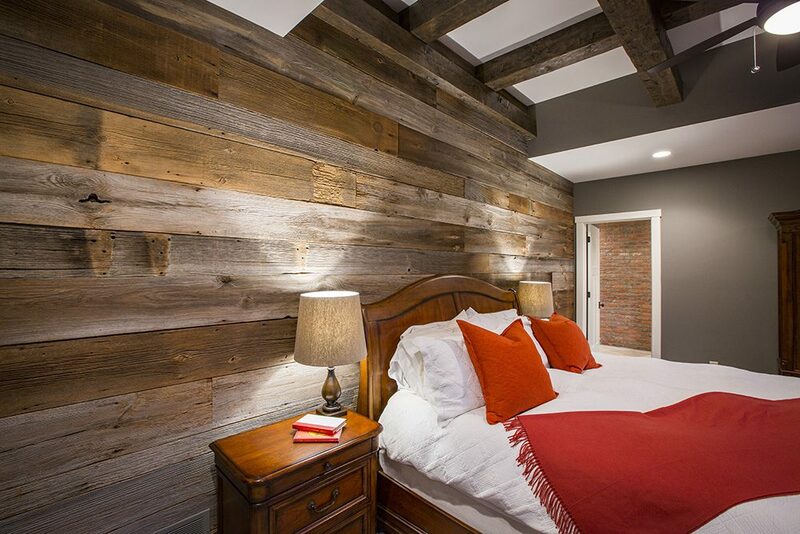 Recently, our clients requested an accent wall in their master bedroom lined with barn wood. As you can see above, the soft texture and color variations of the reclaimed wood make a statement without overpowering the room. The clients also used barn wood as an accent in their kitchen. Mixed with brick, timber beams and cream-colored cabinetry, the wood accent wall adds the right note of rugged refinement. Barn wood doesn’t have to be used in a wood accent wall. 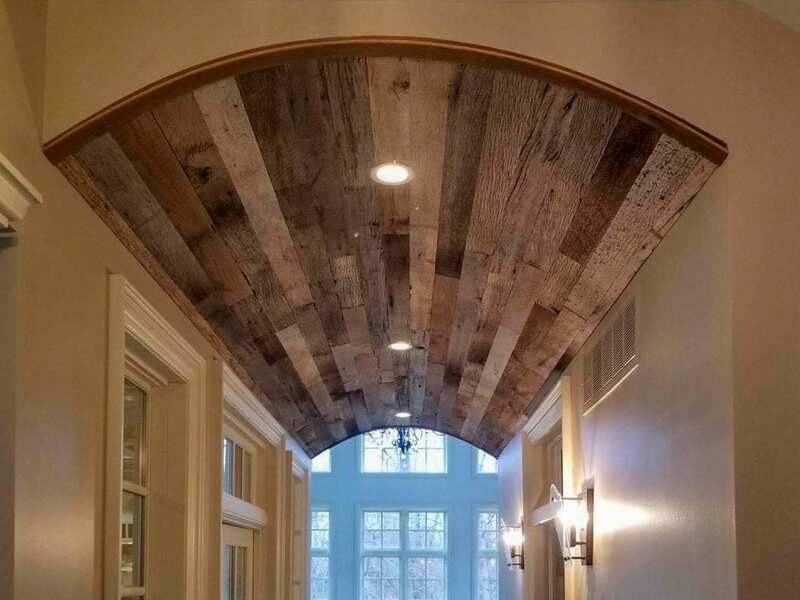 A ceiling lined with wood (like the one above from Ohio Valley Reclaimed Wood) draws the eye up and adds personality. You can use reclaimed wood for cabinetry, shelving or custom furnishings. 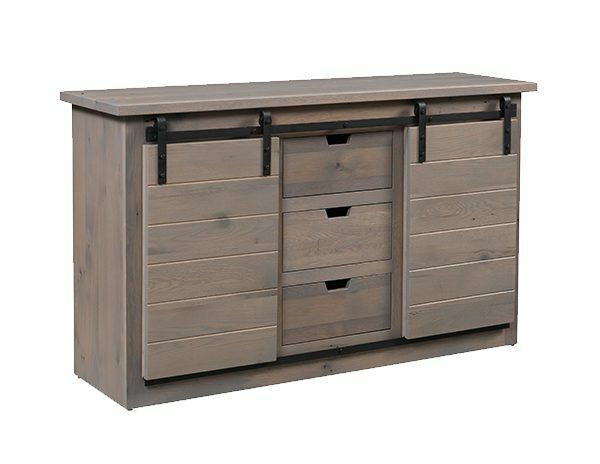 Urban Barnwood Furniture of northeastern Ohio handcrafted this Hartland Server, shown below. 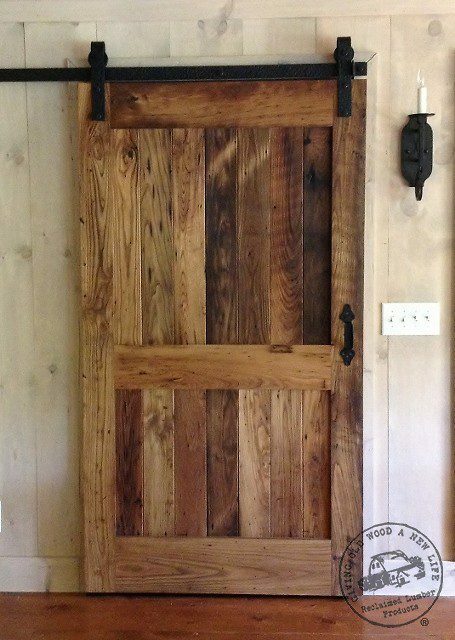 Not surprisingly, sliding barn doors are another great spot to highlight reclaimed barn wood. Depending on how the doors are finished, they can look modern and contemporary or more rustic. 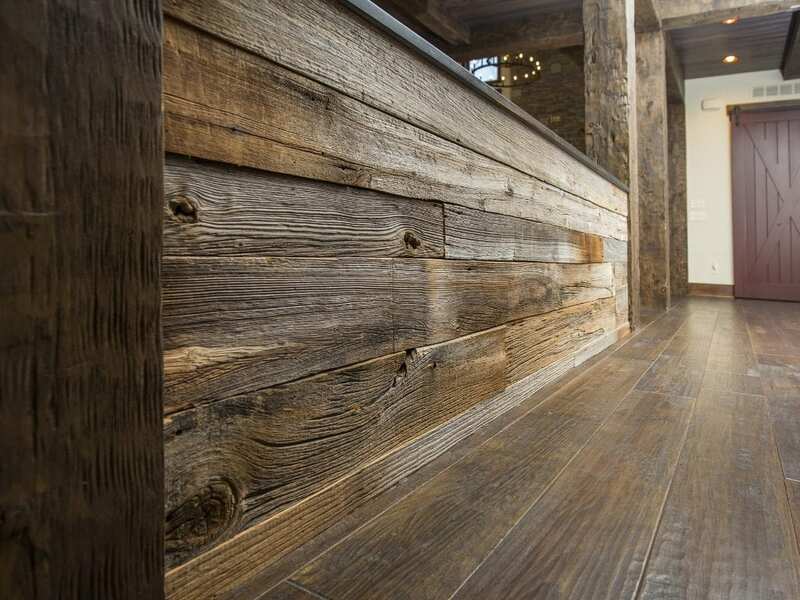 Here’s another example of rustic wood from Reclaimed Lumber Products. Posts, beams and trusses are another great way to use reclaimed wood in a custom home. These architectural elements always elevate a home’s style. In addition to using heavy timber accents inside many clients’ homes, we have also added them as exterior elements. Now that you’ve seen some design ideas, how would you like to add barn wood, a wood accent wall or reclaimed wood to your custom home? We’d love to hear your ideas! Contact us today to talk about making your dream home come true.